Making my Own Butter. And Bread Too. Lately I’ve kind of been on a foodie kick. It all started a couple of months ago when I ground my own wheat into flour to bake bread for the first time. And you know how one thing leads to another. 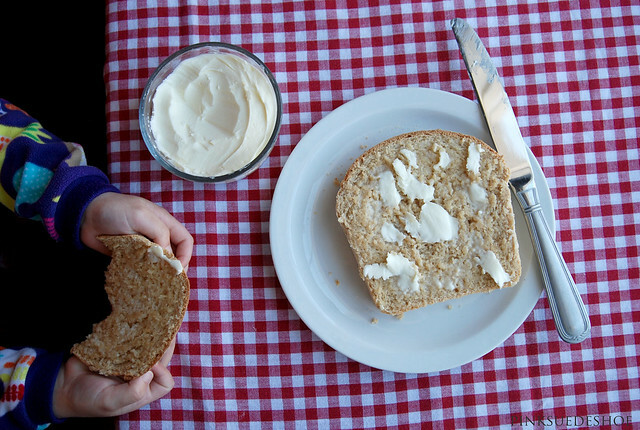 Last week while Creamie and I were home sick we made butter. And I didn’t even see this on Pinterest. Creamie actually came up with this idea all on her own. She has two library books she’s been loving lately where they churn cream into butter. One is Winter Days in the Big Woods (the Big Woods of Laura Ingalls Wilder fame) illustrated by Renee Graef. Well, on Fridays is the day they churn butter and put it in the little strawberry mold. And Laura is too little so she just watches, which kind of bugs Creamie. 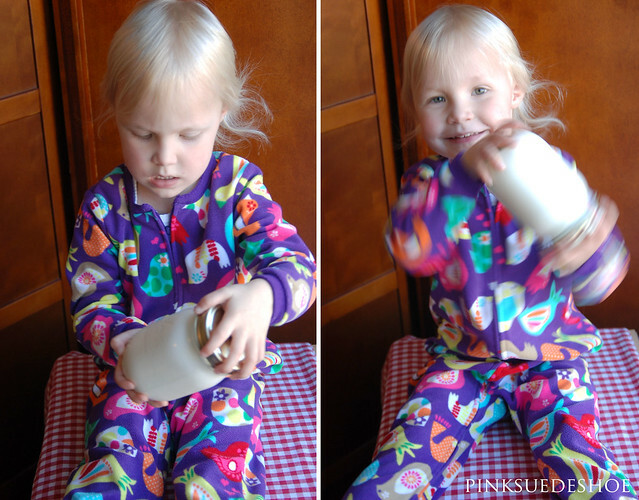 She keeps telling me she has big muscles so she can make butter herself. So funny. And the other book she has been loving lately is Snipp, Snapp, Snurr and the Buttered Bread. 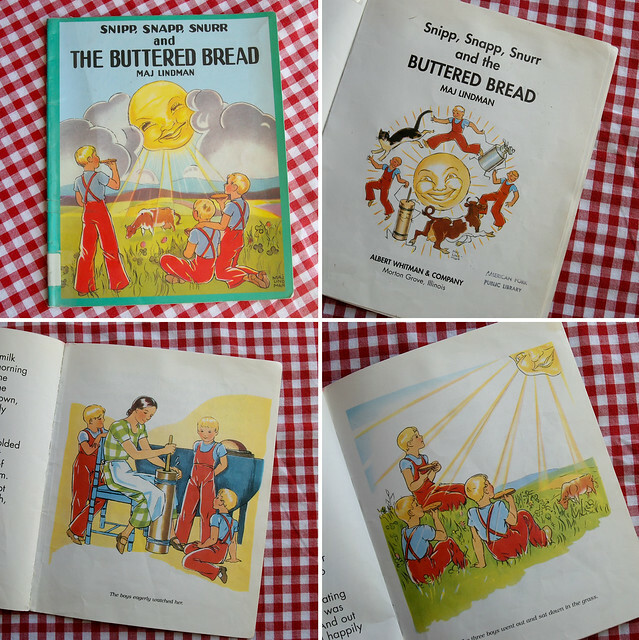 It was published in 1934 and is about 3 Swedish boys who want butter for their bread, which their mother of course churns herself. And after reading each of these books a million times each, Creamie asked me if I could make butter on my sewing machine. She thinks that a sewing machine can make/fix anything. Turns out, making butter isn’t that complicated. So long as you have a few big muscles. Start with heavy cream. 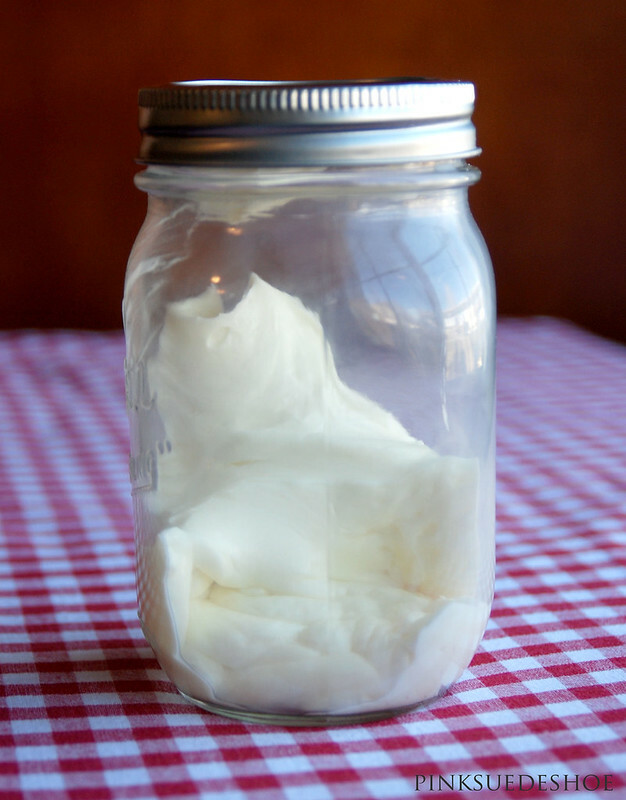 Fill a mason jar, or other glass jar with a tight fitting lid, halfway with cold cream. Mine is a little too full, I had to take some out before I was done. Make sure you screw the lid on tight. Then start shaking it. Shake and shake and shake it. Creamie was interested in this part for the first minute and the last 30 seconds. And I was in charge of the 22 minutes in between. Think of it as a workout. Because your arms will be jello by the time you are done. At first you’ll hear the cream swishing around in there, and then as it gets thicker it will coat the sides of the jar and you won’t really hear it anymore. Then it will start to feel like the whole thing has solidified. But it hasn’t. (This was the point that I opened up my jar, saw that the cream was so thick it couldn’t move around at all and took a few big spoonfuls out and put them in another jar, and the next time I didn’t fill my jar more than halfway up with cream to start out.) A few more minutes and the butter and the buttermilk will start to separate and you’ll hear the sloshing of fresh buttermilk. Shake it a bit more until all the solids pull together into a lump and you have officially made butter. Depending on a bunch of factors, this can take anywhere from 10-30 minutes. 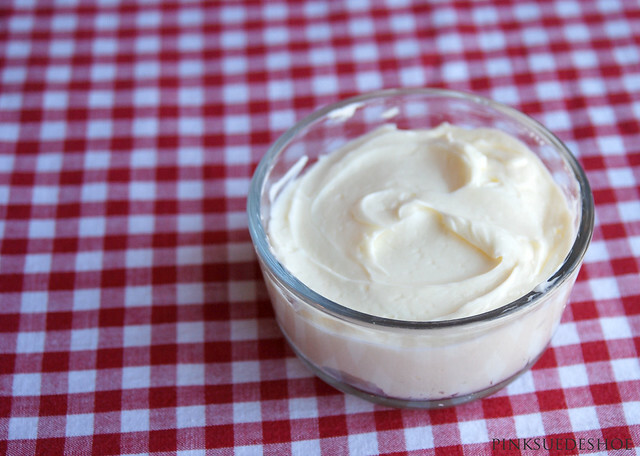 The colder the cream the better, the faster you shake the jar the faster it will turn into butter and the faster your arms will turn to goo. 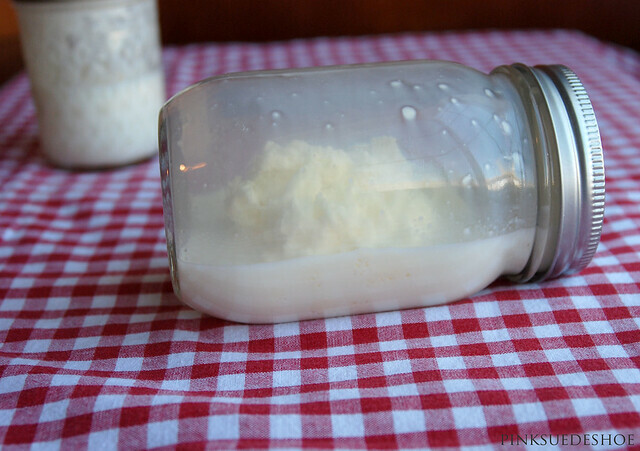 Pour off the buttermilk, which you can save for baking or anything else you use buttermilk for. My mom used to drink it with a bit of fresh ground black pepper. 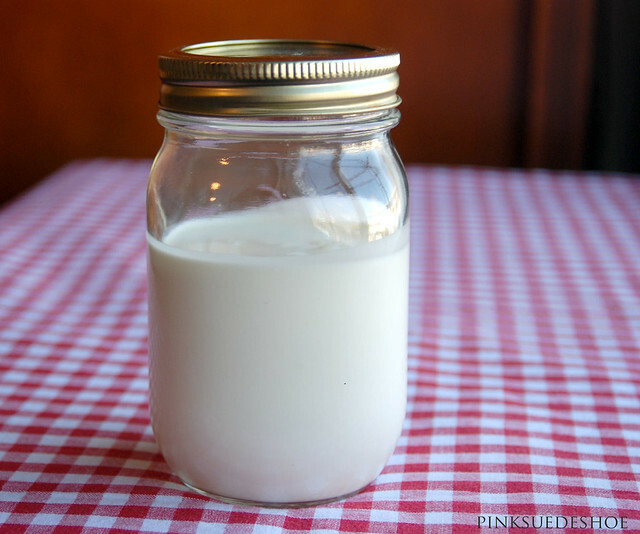 I always thought it looked/sounded/smelled disgusting, I never was a fan of drinking buttermilk. Of course my mom grew up on a little farm with a cow and her mom made butter every single week in her big churn. Butter and buttermilk was a way of life for her. Anyway, back to the butter at hand. After you pour off the buttermilk you are left with perfectly dreamy butter. Stir in a little salt (I only used a pinch). It is barely pale yellow, but nothing like the artificial yellow of most store bought butter. I mean, you can add some Yellow 5 if you want to, but I left mine that perfectly pale pale yellow. Scrape the butter into a dish, it will be really soft at this point, and put it in the fridge for a few minutes to harden up. Keep it stored in the fridge with a tight lid or wrapped tight with plastic wrap so it doesn’t absorb odors from other foods. Spread on the butter and watch it melt into a nice warm slice. And then have another. And then maybe one more. And then try some with butter and honey. My mom gave me this jar of honey for Christmas. It is from a beehive on the street where I grew up. And it is the best honey I’ve ever tasted. My mom is looking into getting her own bees and I can hardly wait. 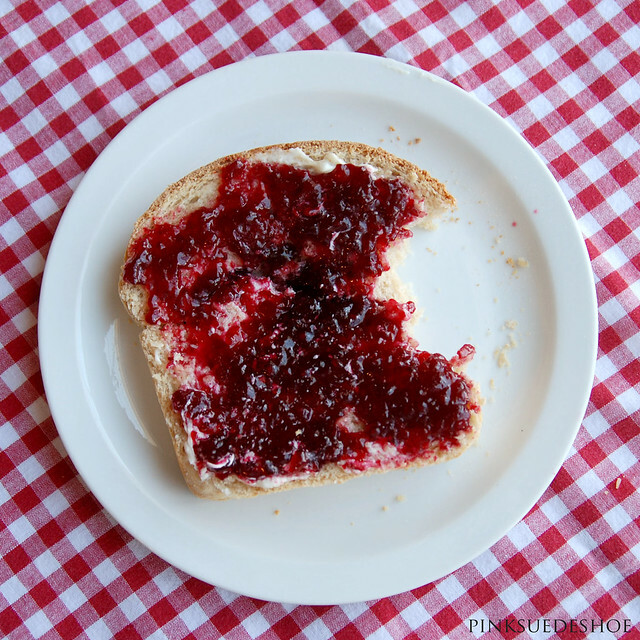 And then I had another slice with butter and my mom’s plumberry jam. We ate a lot of warm bread that afternoon. It was heavenly. 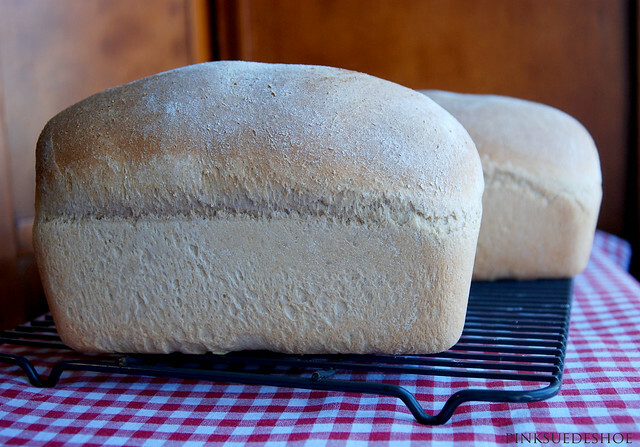 Since I know someone will ask, here is my whole wheat bread recipe. I have a big professional kitchenaid and I always use it to make bread. I don’t know how to make bread without it. I usually use the water/sugar/oil version because it is so much cheaper. But if I have milk that is on it’s way out I’ll use that. Milk and honey bread is delicious, it’s just more expensive. WHOLE WHEAT BREAD 1 hour start to finish. Pour the water, sugar and yeast into the mixing bowl and let it sit for a minute or two. Then add in the rest of the ingredients and mix with the dough hook for 5 minutes on medium high. You should have a smooth almost glossy dough that doesn’t stick to the bottom or the sides of the bowl. Let the bowl down and let it rest for 10 minutes. Raise the bowl and mix for 30 more seconds. Lower the bowl and let it rest for 5 more minutes. Turn the dough out onto a floured surface and form into tw0 loaves. Put them in greased bread pans and let them sit in a warm spot for 15-20 minutes until they have risen about an inch above the sides of the pan. Bake at 325 degrees for 30 minutes. Remove from pans immediately and let cool on a wire rack. NOTES: I have always used SAF yeast. I can get it at my grocery store, but it’s also on Amazon ($9) from King Arthur Flour ($6) and from The WEBstaraunt store ($3). I didn’t check into shipping prices for any of them, nor am I affiliated with any of them, but you have a couple of options to look at there. 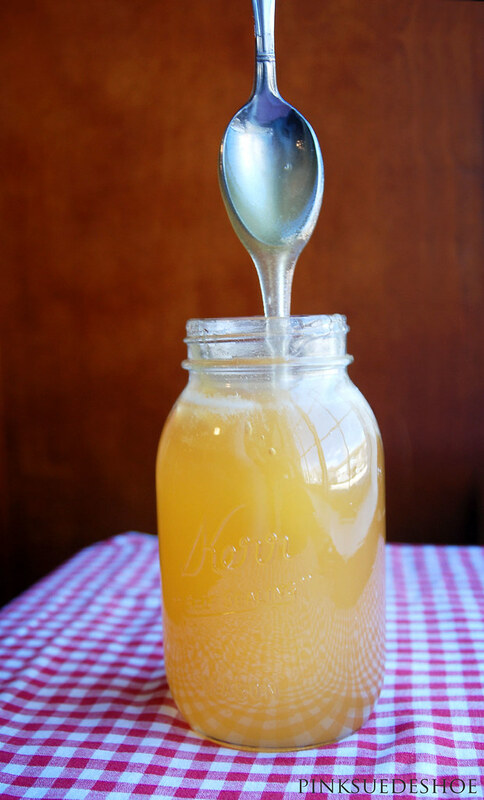 Keep your yeast in a quart mason jar in the freezer. It will last a lot longer without losing it’s magic rising powers. Turn on your oven when you set the bread out to rise. I usually let my bread pans sit on top of my stove to rise because my kitchen is usually pretty chilly. If it’s under 70 degrees F it will take longer to rise. That’s OK, just let it do it’s thing and put it in when it’s an inch taller than the sides of the pans. Use an oven thermometer. I have to set my oven to 350 degrees for it to warm up to 325. The oven will beep and say it’s ready after 6 minutes. At that point it’s usually only about 150 degrees in there. It takes about 12 minutes to warm up to 325. Know your oven’s inconsistencies. And believe me. It has them. And one more kind of embarrassing confession… I can’t cut a straight slice of bread to save my life. It’s impossible. My loaf always ends up looking like a trapezoid before it’s half gone. I’m a dork. I am in no way a bread expert. I only make one kind. I’ve been using this recipe since I was about 6 or 7 years old helping my mom and I just stick with what works. Maybe one day I’ll branch out, but as they say, if it ain’t broke, don’t fix it. But you should probably paint it pink and decorate it with washitape no matter what. TRY IT WITH THE SHAKER FROM TUPPERWARE!!! Love the Snip, Snapp Snurr books, too. I do applaud your energy on the butter-making front. Don’t need a gym membership to tone those muscles! I would probably implore my friend at a paint store to put my jar in a paint shaker! Enjoy! If you rinse your butter, after pouring off the buttermilk and before salting it, it will keep longer before turning rancid. Yep… knead the butter in cold water, changing the water once it turns cloudy… after several changes of water, it should stay relatively clear – that means you’ve gotten out all that extra whey/”buttermilk” that will cause the butter to go rancid more quickly. Also, as someone else mentioned, the KitchenAid (or any stand mixer) makes butter quickly and easily when you’re not interested in the pioneer effect 🙂 – just pour your cream in and whip til solid! wow. all I can say is wow, making your own butter. Sounds divine. Thanks for this recipe. I tried it over the weekend and it’s delicious! Yay! That warms my heart. Thanks for telling me it worked out!